Color damage indicator with timer for WOT 0.9.17.0.1 combines the functionality of marker enemy attack and reload timer. Now you will see not only where you are shooting for, but in addition will be displayed timer from the last date of receipt damage. And if you know exactly what tank was shot you, you will be able to calculate its approximate recharge time and no longer slips under its shots. Important! 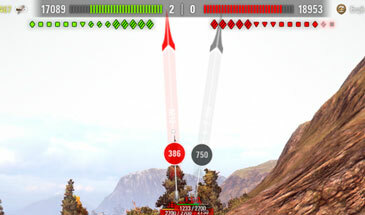 To operate an extended time display mods damage indicator in the game settings must be enabled in advanced fire indicator.